Okay guys, It’s been awhile since I’ve posted anything and I apologize due to the fact that we’re at the end of our semester nearing graduation so a lot of us in web dev are finishing or starting on our portfolios. Either way, I wanted to share some helpful links that’ll go hand in hand with anyone looking into having some icons for their website. Here’s a few good websites with free universal icons. Linear Icon’s is a set of line icons, matching with minimalist UI designs in iOS. This icon pack was designed on a 20×20 grid. They have packs of free Icon and for more advanced users they also include a pro. IcoMoon Icon’s provides a package of vector icons, along with a free HTML5 app for making custom icon fonts or SVG sprites. Browse among thousands of pixel vector and sprite icons. This is more for the modern day designer/developer looking to find something that fits the trend curve. these icons are more for the appeal of the trending outlets. Although IcoMoon is about the same as Linear Icons. Thank you all for subscribing to my wordpress. Once this school term has ended I’ll try my best to keep this going. Okay, so I found this interesting site for responsive mockups and i thought hhmmm why not share it with my other web devs out there. Most of you probably know what this website is if not lets briefly go over it. Blazrobar was created mostly dedicated to giving free graphic design content with hundreds of free resources that have been shared by a community of like minded developers and designers sharing design tips and tricks that have been learned from other fellow designers. From PSDs, to PSD templates, website templates and Photoshop files for designers and developers to enjoy and use. And the best part is, there’s no worrying about copy right! All files on this website are free for you to use in anyway you see fit. how you use the files that even Creative Commons is too strict! No attribution is required, you can even use it commercially; all that is asked is that you don’t distribute the files on other websites without permission. So that’s it! Feel free to check out Blazrobar for more info. Free Responsive templates released under the creative commons license. Sustainable energy is slowly becoming a wide spread phenomenon across the world. We can power our houses, cars, phones using different methods of solar powered panels and plants with some kind of photosynthesis that allow us to absorb the energy from the sun needed for power. 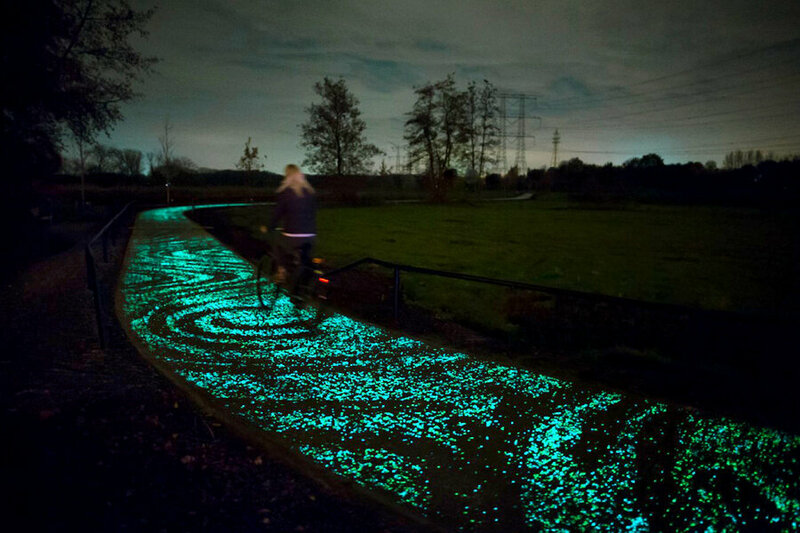 Studio Roosegaarde has taken this to the next level and has installed this 3,000-foot bike path to commemorate the 125th anniversary of Vincent Van Gogh’s death. The aim is to bridge art and tech inspiring people to create sustainable energy neutral landscapes. They took thousands of twinkling stones to light up the path covered individually with a photosynthesized coating (combined with auxiliary solar panels for darker days) that when in the sun keeps it glowing for about 8hrs. This project has also inspired other works in the makings such as the blue bike path in Poland made from a similar material called phosphor that can also be recharged by the sun in hopes that this trend will catch on in other parts of the world. So what do these eye catching bike trails have to do with technology, well in a way sustainable energy could be one of the main sources of power and showcasing something that can potentially change how we use sustainable energy can be part of the bigger picture towards where it could possibly take us. As designers we know that the web is always interchangeable, with different trends changing websites and apps must continuously change with them. Google understood this offering up new collaboration tools for web designers, they called them Material IO (Material Design). Material IO consists of different tools ment to be used as interface tools that allow designers and developers to build app interfaces. While they appear to be tied to the company’s Material Design language, which launched in 2014, it looks like they’ll be able to use them regardless of what design principles they decide to follow. Gallery lets them upload, share and comment on designs. offering version control as well as a way to present the work without the need to attach PDFs or slide decks. If you’ve used collaboration tools like InVision, Gallery might seem familiar to you. Remixer and Stage allow you to create interactive app prototypes for iOS, Android and the Web. They also let you tweak visual elements on-the-fly and even test movement and animations. In addition, Google has collated all its Material Design resources – from guidelines to icons – and put them all on a new site, material.io. The video below is a brief over view explaining exactly what material IO is and what it can do. This isn’t the first time Google has made resources available to the community in recent history. In March, it released Resizer, which is meant to test breakpoints, responsive grids and surface behaviors along with UI patterns for Material Design on the Web. Alright, usually i do something cool with technology but seeing as some of us might be freelancers in the near feature or what not I thought it would be good to know somethings about business oriented terminology such as Invoicing and how our goods and services provided to clientele are payed for. what is Invoicing? check out this brief video provided for a summery. Throughout this article I’ll be listing different invoicing options (aside from quickbooks and regular online banking) that are helpful to freelancers or small businesses and ways on how to take a advantage of them and how the freelancers union can help a person get payed for his/her work. Due is a payments solution company that offers time tracking, customizable estimates and invoice templates, over 100 currency and language options, a database to store client and staff information, document attachment, and email and website embedded invoices with option to pay directly. Unlimited invoices, clients and time tracking. It offers integration with Paypal as well as several other companies. Additionally, Due offers a free digital wallet feature and ACH payments as well as domestic and international payment processing. You can send unlimited professional invoices per month for free and enjoy a low flat-rate transaction payments fee of 2.7% for credit card processing, including international payments. They even offer payment processing so you can control all your business processing in one location. With multiple plans, the free plan is generous with 15 clients, 15 invoices, 7 subscriptions, and 30 estimates per month plus two invoice layouts. With this free online invoice tool, you get access to features like estimates, recurring invoices, time tracking, expense and income tracking, multiple tax settings, document attachments, saved items, security features and invoice templates. You can speed up your client payments by integrating eWay, Paymate, Authorize.net or PayPal. CitrusDB is an open source customer service and billing software. If you are technically inclined, you can use and contribute to the process of improving this online invoice service without having to pay to use it. CitrusDB offers a customer service database, service management functionality, a billing system for printing and emailing invoices, credit card batch capabilities, multiple languages and all types of customization. It can also be integrated with various payment processing tools. 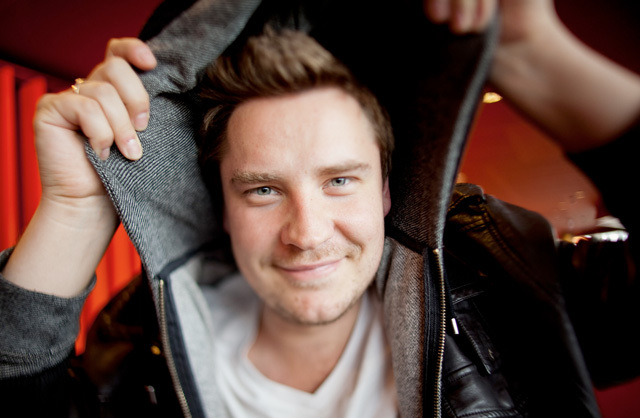 Xero is an online account software alternative to Quickbooks. They offer a very intuitive invoicing feature for small businesses as well as several other accounting features. Xero makes it easy to get a real time view of the cashflow of your small to medium sized business. Invoicera is a popular online invoice and payments tool among freelancers for the number of features and ability to enjoy it free for up to three clients. It delivers online estimates and invoices, time tracking, free invoice templates, subscription billing, and multiple currencies. Invoicera provides you with a dashboard that lets you see and manage expenses, finances, projects, staff, tasks and clients in one location. Its payment integration tools include Authorize.net and PayPal. Once known as Curdbee, Hiveage is a fast, free, and effective online estimate, invoice, billing and payments tool. The standard account is free and comes with numerous features, such as unlimited invoices and customers, multiple currency support, and PayPal Standard integration. Other features can be added for a low-cost premium account with Hiveage, such as mileage, expense, and time tracking as well as subscription and auto billing, financial reports, and the ability to oversee the billing and payments for multiple teams and businesses. Other payment processing systems can be integrated within the premium account like Stripe and 2Checkout. FreshBooks still offers a 30-day free trial but now charges for its smallest service plan that gets you all the features for up to five clients. There are significant features to enjoy for this low-cost price, including customized quotes, estimates, and invoices as well as the ability to print, download a PDF, or email your invoices. You will also know when clients open your invoices. Other benefits include time tracking, expense capture, the ability to add receipts to an invoice, and recurring invoices. You can accept credit cards on invoices through payment processing capability with PayPal, Stripe, or Authorize.net integration. Made for small businesses, freelancers, and individuals, Inspire Pay is a fast and basic way to get paid. You simply create a custom payment page, share the custom URL for that page with your client, and receive your funds. You can customize and brand your payments page and then share it via text, email, Twitter or Facebook. Payment methods include Authorize.net, PayPal, Dwolla, Sage Payment Solutions, Inspire Commerce, American Express, Mastercard or Visa. All you pay is a transaction fee for each payment. Otherwise, it’s completely free. While not free, they do offer a low-cost monthly option of $19 per month that allows you to control your accounts receivable or accounts payable function. It comes with unlimited document storage, import and export of data, payment support, and a Business Payments Network that allows you to connect and collaborate with customers and vendors. They do charge extra to send your invoices for you and also have a menu of add-on services that each add to the monthly fee you would pay to use their invoicing and payments platform. Although it is not free, Quickbooks Online is an affordable solution for access to a complete invoicing, payment processing, and bookkeeping tool. Regularly priced at $12.95 per month for the cheapest plan, the company often offers promotional discounts or a lower price when paying for a year upfront. You will be able to track expenses and revenues, create and send estimates and invoices, and synch your bank account for easy payment. Quickbooks Online also has other payment processing integration as well as works on mobile platforms through its app. knowing your rights as a freelancer is a great advantage in any business, Sara Horowitz is the Founder and Executive Director of the freelancers Union and has strived to help men and women with goals throughout the nation. Nearly one in three working Americans is an independent worker. That’s almost 54 million people – and growing. At The Freelancers Union, they strive to make freelancing better now and in the future through joint benefits, live member events, expert guides, and online networking opportunities. action, research, and thought leadership. We aim to ensure that independent contractors receive adequate rights, protections and professional benefits. Members of Freelancers Union play an active role in leading community initiatives and advocacy campaigns. check out The Freelancers Union for more info. Water damage tech no more! YES! Someone finally invented a piece of technology that successfully repairs any water (liquid) damaged devices! Hail Science! (two actually) Having said that, sucking out water with rice, or condensing it in isopropyl alcohol aren’t always effective methods to repairing the damage. Most of the time only the pros on the internet know what they’re doing. Here now are finally the times in an age where upgrades are forced upon us come the fall season, or better now known as upgrade season. but not everyone wants to join the bandwagon of the latest flashy tech trends advertised, there are some people completely content with the current smartphones and would just be happy if they worked like before. Well, there are two companies to claim that they have found the solution to the problem over 2 million people have suffered, no rice is needed. The good people at Denver have spread hope, in the form of a pair of competing companies that use a combination of vacuum and low heat to vaporize the water out of devices. The methods, these companies say, get water-impaired electronics up and running — with their data and settings intact. hope, in the form of a pair of competing companies that use a combination of vacuum and low heat to vaporize the water out of devices. The methods, these companies say, get water-impaired electronics up and running — with their data and settings intact. 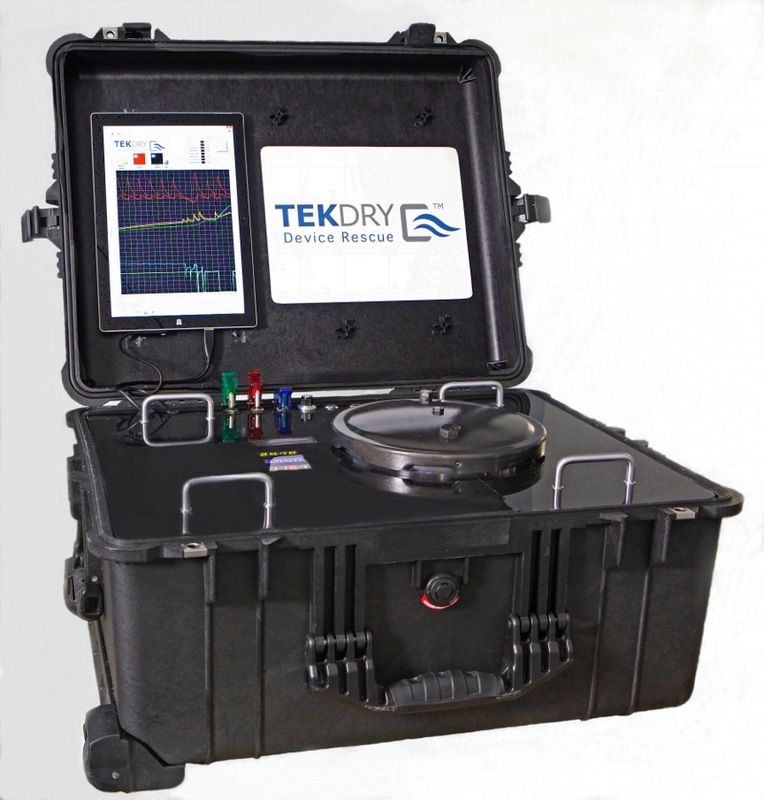 TekDry and competitor DryBox offer a similar service: place your device inside the kiosk and wait for a few minutes as a vacuum pump depressurizes the container and low heat helps boil away the water vapor. It can dry out cell phones, laptops and other electronics in as little as 20 minutes, for about $20-$80. Water boils at lower temperatures if the pressure is also low – it’s the reason brownie mixes require slight alterations at high altitudes. “Electricity and water are not friends,” said Craig Beinecke, co-founder of Colorado-based TekDry. 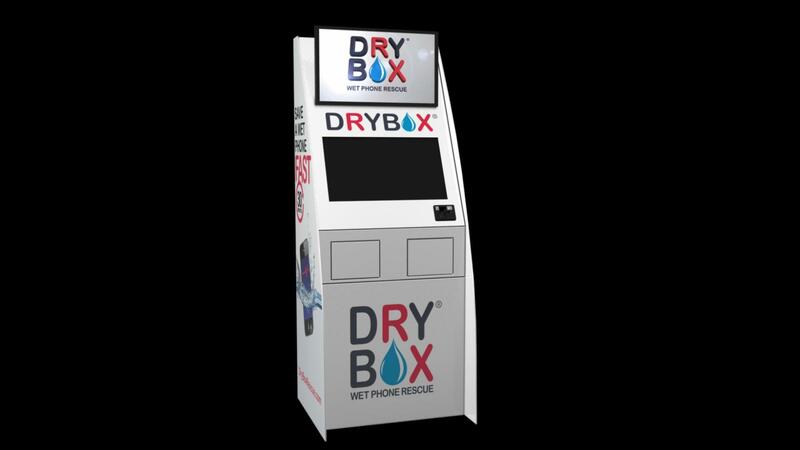 DryBox hit the market first in 2011, and has expanded to several Texas malls since then. The company has just signed a deal to put its kiosks into stores of a major grocery chain, Naumann said. A machine is also available in New York’s Times Square. TekDry is just getting started with a handful of machines in Colorado but it is also talking with major retailers. TekDry customers can also mail their devices to the company. Naumann said the company’s research indicates about 100,000 phones get wet every day, depending on the season, soaked in everything from toilets and bathtubs to hot tubs and the ocean. Both companies say acting fast and keeping electricity away from the phones until they are dry is key. Turning it on or plugging it in is probably the worst thing you can do. And rice? Well, they both say immersing soggy electronics in a bag of rice doesn’t really work. You’d probably be just as well off setting your phone on the counter and leaving it alone for a few days, where air can circulate through it. Even then, there’s no guarantee that will work. 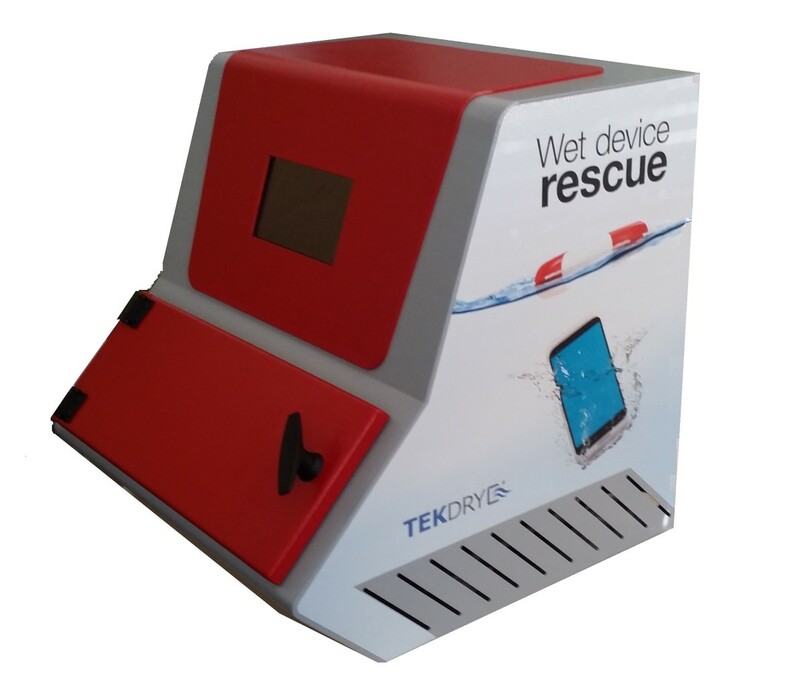 TekDry and DryBox each offer a money-back guarantee if their technology fails to save your technology, and after of thousands of rescues between then, they claim a 70-80% success rate. Beinecke said his most miraculous rescue was of an iPhone found under a lake after 26 hours, and then left to dry at the finders’ home for five more days. TekDry has dunked dozens of phones dozens of times to develop the right balance of low pressure and low heat: “The day the iPhone 6 came out we bought one and dunked it,” he said. With the cost low and convenience high, Naumann and Beinecke said there’s no reason not to try their machines, because they’re offering far better odds than rice.